Hungária, Bastya, Vörös Lobogó, MTK-VM, all these are names under which MTK have won some of their 23 Championship titles, a number second only to that of another Budapest club, Ferencvárosi. Second in Cup triumphs as well, MTK's best days may be well behind them, but thankfully for them, no one can erase their history, and based exactly on their history, they have every right to feel they have earned a spot in Hungarian football's elite for life. 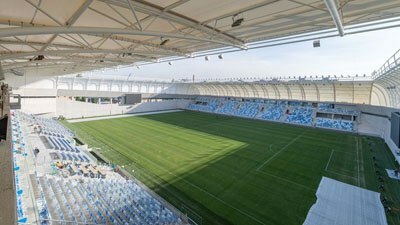 MTK's modest Hidegkuti Nándor Stadion after its 2016 reopening. Magyar Testgyakorlók Köre (Circle of Hungarian Fitness Activists) Budapest were founded in the very distant 1888 by no more than a dozen well-off members of the city's large Jewish community, and, as the name suggests, the club included various sections. The football one wasn't established until 1901, a bit late to participate in the newly-set up national competitions. Next year the team did well in the second division, earned promotion to the top one, where they stayed until 1981, when they got relegated for the first time. By 1925 MTK had already won 12 championship titles, topping the league in half of its seasons (the inaugural one was in 1901). Under the name “Hungária”, the team won three more titles before World War II broke out. Because of being tightly associated with the Jewish community of Budapest, the club were not allowed to take part in the championship the years Hungary spent under Nazi occupation. Amazing as it may look, MTK won three championship titles in the fifties under three different names, Bástya, Vörös Lobogó, and, finally, MTK Budapest, in 1958. Along with national titles, the team started earning international fame as well, mostly thanks to their players who formed part of Hungary's impressive national team of that time, considered by football experts as one of the best teams not to have won the World Cup at their prime, just like Johan Cruyff's Netherlands in the seventies. The sixties brought even more international recognition to the club, reaching the semifinals of the Inter-Cities Fairs Cup in 1962, winning the Mitropa Cup in 1963 (second success in the competition, they had won it in 1955 as well), and losing to Sporting Lisbon in the 1964 Cup Winners' Cup final (in the second game, since the first one ended in a 3-3 draw, and back then there were no penalties, so a rematch had to be played). After that 1958 championship title, MTK had to wait three whole decades to celebrate finishing at the top again, this time as “MTK-VM”. Before that, the team had reached their lowest point, getting relegated at the end of the 1980-81 season. In 1994, MTK got relegated for a second time, only to return to the top league right away. Two championship and three cup titles between 1997 and 2000 made their fans feel they were back for good, the team did stay competitive, finished two more seasons at the top the coming years, but with new peripheral powers, teams from outside Budapest, adding up to the existing traditional football giants of the country, the competition proved too much for MTK, who, since 2008, have struggled not to win more titles, but to stay at the top category. The luckiest MTK fans have been the ones who had the privilege to watch their team between 1947 and 1964, which is when the club's two biggest figures were the main attraction. Lacking the big fanbase of other Budapest teams, MTK seem to have compromised with the fact that they cannot be what they used to be, more recently in the late 90s. This, though, doesn't change the fact that these three initials are stamped on Hungary's football history, in golden letters. Károly Sándor, a just 1.58m tall right-winger, joined the club in 1947. Seventeen years later, when he hang up his boots, he had played in 379 games (and scored 182 goals, second in this list), a number bigger than anyone had reached before, or has reached ever since. The only player who is even bigger in MTK's history, is the one whose name was given to their stadium, an honour almost always reserved for the most prominent figures in a club's history. Nándor Hidegkuti, one of Hungary's, not just MTK's, biggest players ever, joined the club the same year Sándor did, but ended his career much earlier, in 1958. Even so, he scored a total of 222 goals for the Budapest team, while also starring in Hungary's national team, scoring a further 39 goals in 69 appearances. As for the stadium named after him, you may have seen it even if you've never watched an MTK home match on TV (or visited it). It's where a good part of the 1981 movie “Escape to Victory” was shot, featuring famous actors but also huge football legends, including possibly the biggest player in the history of the sport, Pelé. For a club that have changed name several times throughout their history, MTK have had rather few changes in their crest. Excluding the fifties when even the colour of the jersey was changed, the team have had for most of their existence a logo quite similar to today's, with the tone of the blue colour changing from time to time. As for the two stars on top, they correspond to the more than 20 Championship titles MTK have won, 23 more specifically.